Sublime Seclusion Close To Everything! Nestled in the hills in the lap of the Aquacate mountains overlooking San Mateo and the Gulf of Nicoya, Nido de Nicoya is a rare find. When we chose this spot to build a vacation home, it was because it had everything we were looking for: easy to get to (less than an hour from SJO airport), great views, natural setting, wonderful climate (National Geographic called nearby Atenas the world’s most perfect climate), close to amenities and healthcare and a reasonable driving distance to San Jose, beaches, diving, surfing, fishing, volcanoes and all the other things associated with Costa Rica. What we have come to realize however, is that this is a place where you can peek behind the curtain, and experience the real Costa Rica. A sanctuary where a mix of expats and locals (ticos) are living in harmony and enjoying a warm and peaceful existence where friends are made easily, exotic bird and monkey sightings occur frequently, and the setting is as natural and beautiful as anywhere in the world. If you want a lot of action this is not the place for you. If you just want to take it easy and drink in the view, bird watch, catch up on your reading by the pool, take a nap, go on an excursion or venture into town for some shopping and fresh fruit (it’s awesome and cheap! ), then we think you’ll like it here. If you decide to visit, we hope you will enjoy staying here as much as we do. Our home is built on two lots and features 3 BR's and 2.5 baths in the main house, which is 1800 sq. ft. With another 1000 sq.Ft. Of covered terraces. There is a guest house by the pool that has a small kitchen, living area and separate BR w/queen bed and a full bathroom. The main house has a mbr on the 2nd floor with a king bed, full bath w/separate shower and jacuzzi tub, walk-in closet, coffee bar w/fridge and a splendid covered balcony with the best views on the property. There is also a laundry room on this level. Downstairs are two brs, one w/a queen bed and one w/two singles and a jack and jill bathroom. The lr, dr and kit. are on this level and open out to a covered terrace through two sets of double french doors. There is a carport for covered parking. I grew up in Norfolk, VA where I currently live, and graduated from ODU with a degree in English and am a Realtor. I enjoy travel, tennis, surfing, reading and spending time with friends and family. Easy access, great views, private, beautiful setting, close to shopping, medical and amenities. Ideal climate, fabulous views, and unique mix of expats and friendly locals who share a love for this very special place. All bathrooms have tile and granite vanities. Parking for 2 vehicles in covered carport. Indoor dining area seats 4, outside table seats 6. Pool dining table (With umbrella) seats 4. This house is semi-new, completed in May 2013. Great place! perfect for family vacation! We spent a few days on this amazing property. Everything was as offered, the house is very comfortable, in touch with nature, specially we enjoyed the pool. Antonio, came and cleaned the pool everyday , that was wonderful. We recommend it without a doubt! Great Home with Beautiful View!!! Had a great time at Nido De Nicoya. The house has all you need and is very clean. Despite the A/C not working in the living room area, the house remained cool for most of the day. The home is conveniently located close to the beach and the airport. It is also only a few hours away from Arenal Volcano and Manuel Antonio National Park. Antonio, the pool guy, was super helpful and gave us great advice about things to do around the area. We couldn't be happier with the property and hope to come back soon! The pictures do not do this place enough justice! The view is amazing! Very clean and well-maintained. Elliot went above and beyond to help resolve a small booking issue that arose when I booked the property. The property manager, Linda, was very helpful and gave us great suggestions for things to do during our trip. 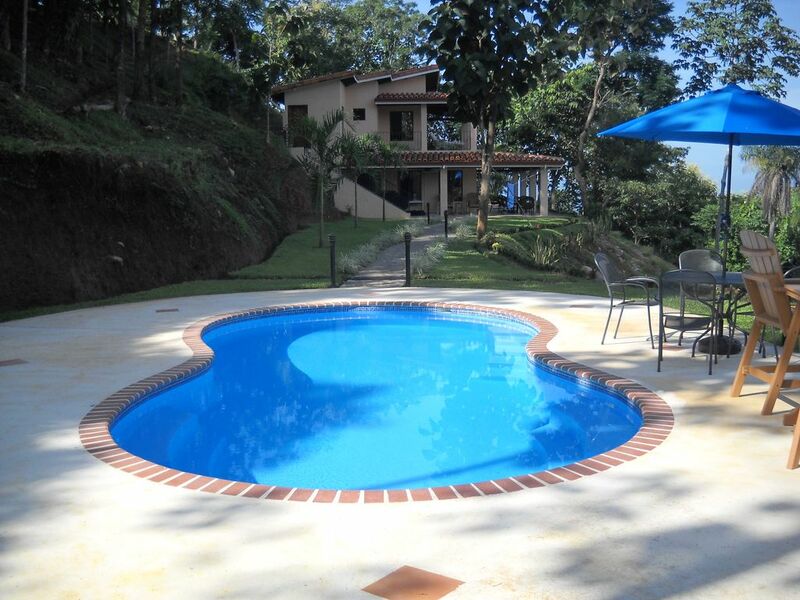 Would definitely recommend this property to anyone visiting Costa Rica. Beautiful home, beautiful location. We couldn't have been more pleased. Our only regret was that we couldn't stay longer. Michael and family, so glad you enjoyed staying at our place. Thank you for coming and being such great guests! Thank you for your review. My apologies for the a/c in the master bedroom being out. As you observed, the geckos have been known to get inside the units and cause the electronics to short out (while doing themselves in) and repairmen are not always immediately available in CR, though I have been informed that the unit has now been fixed. Fortunately, the nights are cool at our location, so I hope you were able to be comfortable. I apologize that my property managers did not inform you at check-in that your deposit would be mailed back to you, and I will address this with them. We do it this way because we have found that it is not practical to refund it to guests before they leave, as the check-out inspection takes time and guests are usually in a hurry to depart to get to the airport. To date, everyone has had their full deposit returned to them within two weeks of arriving back home, as will you. Thank you for staying with us and Pura Vida! A Little Slice of Secluded Heaven! We couldn't have planned a better trip, if we tried. Gal-intine 2017 vacation with a group of 7 ladies with ages ranging from 25-40. If you're looking for a party house, I'd recommend looking somewhere else b/c this ain't it. This vacation was a bit off the beaten path. It is a perfect getaway from the hustle and bustle of daily life and a truly relaxing way to spend a few days. The property itself is nestled high up in the mountains which lends itself to spectacular views. The kind of views that make you never want to leave CR and have you seriously contemplating becoming an expat! The main house + cabina fit 7 girls comfortably. The kitchen comes fully stocked with all the basic necessities to cook/bake/bbq/blend/etc. and a quasi-stocked spice cabinet, which is something lacking in most rentals. The beds are comfortable and the rooms can be temperature controlled individually but you won't need to in February. There are also many activities in the surrounding area. We drove up to the rainforest to Arenal Hanging Bridges, La Fortuna Waterfall, Baldi hot Springs, and booked a tour to Tortuga Island​. We would've done more if we stayed longer! The town is a short drive away where you can stock up on the necessities and/or grab a bite to eat. The seafood restaurant in the middle of town is delicious! The town itself has not been overly developed (touristy) so you get to experience the real CR and the friendly ticos. Elliott made sure we were well taken cared for and provided useful tips to make our stay as enjoyable as possible. We would love to return and would highly recommend this rental home to our friends and family. A $100.00 Cleaning Fee will be added to all bookings regardless of length of stay.